To get a better understanding of what’s affecting Ireland’s property prices, you’d have to learn about some key events which transpired in the past years. Prior to 2007, Ireland was enjoying a steady economic growth. Investments were pouring in because the country had more competitive labour costs as compared to neighbouring countries. Employment rate was increasing and so were employee wages, which enabled people to purchase properties. Eventually, this led to an increased demand for properties which consequently ushered in a property boom. Numerous residential and commercial development projects were happening all over the country. With the property boom, the government experienced a significant increase in revenue. This prompted them to support the efforts of the property sector by giving them tax incentives. Meanwhile, banks were generously lending property developers money. So, developers continued building. However, the prices of properties were steadily rising, too. Eventually, the demand fell. Developers ran out of funds. They were unable to sell their properties because these were unfinished or there were no buyers. 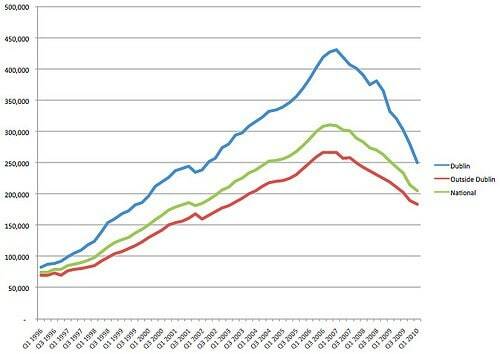 Simply put, the property bubble burst; Ireland’s economy crashed. With the economy in shambles, emigration drastically increased as well as the number of unemployed people. As for the real estate sector, it crumbled, leaving behind countless unfinished projects and uninhabited houses. Then came the global recession which further exacerbated the country’s economic situation. Fortunately, in 2014, the economy started getting better. In fact, during this year, Ireland posted the fastest growth rate in the European Union. This development attracted more immigrants to move to the country and encouraged some Irish emigrants who left during the recession to return home. With the influx of people and the resurgence of the economy, the demand for properties significantly grew. The supply, on the other hand, remained very low. As per property or estate agents, while there were second-hand homes available, there were actually no new houses to sell. This scenario was what primarily caused the property prices to go up, especially in areas like Dublin, Cork, Galway, Limerick and Waterford where most of the working population reside. Efforts to find a market equilibrium state wherein the supply matches the demand are underway. The construction industry is on a mission to build more properties to address the shortage. However, it may take a while before this is achieved as the demand for properties is projected to continue growing. Why? This is because the government just recently launched the Help-to-Buy Scheme. Basically, this program is meant to help first time property buyers purchase their first home. Without a doubt, the Help-to-Buy Scheme is a great initiative. The only downside is that, as this scheme makes acquiring a house a lot easier, more people are going to be encouraged to make their first property purchase. This means more properties need to be built. Consequently, unless the construction sector is able to keep up with this demand, you can expect property prices to rise especially in more populated areas. To learn more about the property prices in different areas in Ireland, call us now 014959020.